We convince our mother that we can walk to a store on our own and find something for dinner. The chicken needs to be decapitated. There is no other way out of this situation. It’s already dead, but as my sister and I stare at the limp-necked and limp-limbed plucked chicken lying on the meat counter, we know we can’t take it back to the apartment that way. It’s supposed to be cut up in pieces, lying on Styrofoam, and wrapped in plastic. The woman behind the counter stares at us, while she pushes back a brown curl too short for her hairnet. I raise a finger as if I want her to wait a minute, and then my sister and I turn and examine the items on the shelf behind us. It is July 1977. My parents, two younger sisters, and I have arrived in Vienna, Austria, where we will spend the next year while my father works at the International Atomic Energy Agency. The first few days are disorienting. My sisters and I have never lived anyplace except Los Alamos, NM, a town of approximately 15,000. Now, we are in a city of several million people. We walk down the street unable to understand what we hear, read on store signs, or glance at in a news kiosk. We have never seen so many buses, trams, and trains or heard so much noise on a street. Initially, the three of us are perplexed when elderly women approach us, say something incomprehensible, and then pat us on the cheeks. After a while, we realize they are intrigued by our masses of freckles, which the hot, dry New Mexico sun produces in quantities the grayer, more temperate Viennese climate does not. While we are looking for a place to live we temporarily stay in an apartment owned by someone who runs a Junior Year Abroad program and spends every July in the States. This apartment is so small that instead of sleeping in a bedroom with my sisters, I sleep on a couch in the living room. In the morning, my father’s footsteps wake me up when he heads to the bakery to buy rolls for our breakfast. I am twelve years old. My next youngest sister is ten. After a few days in Vienna, the two of us feel that we should be allowed to do something on our own. We have seen lots of children on the street, many of the younger than us, playing and running errands by themselves. We convince our mother that we can walk to a store on our own and find something for dinner. It’s supposed to be cut up in pieces, lying on Styrofoam, and wrapped in plastic. 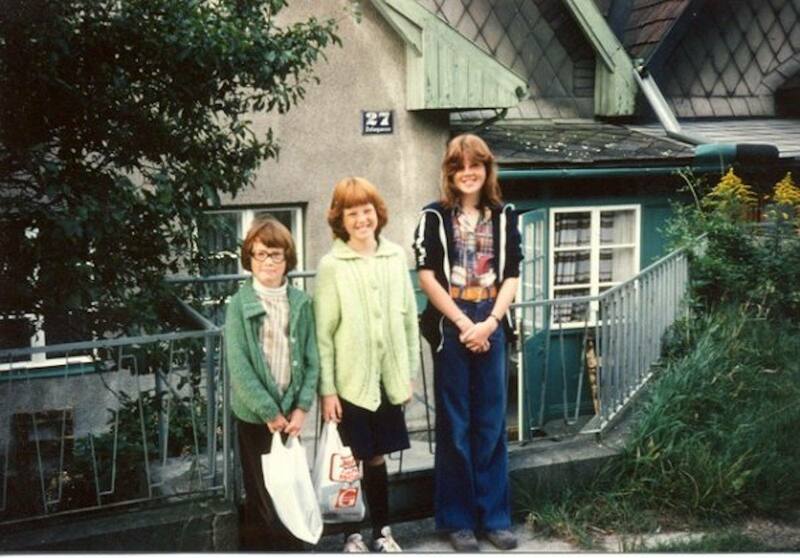 First Day of School; image John Foley (Margaret on right). Heads not properly cut off. Blood spurting from a vein. The slimy feel of pulling out the innards. We walk into the first grocery store we see. The interior surprises us. It is not nearly as large as we anticipated. There are no carts, only small wire baskets. The shelves are low and small and do not hold a large variety of goods. Much of the food is behind counters staffed by women in flowered smocks and brown hairnets. My sisters and I find ourselves in front of a counter where we see sausages and various pieces of meat, and an array of dead birds hanging from hooks. I sigh, purse my lips and approach the counter. I point to a chicken. The woman pulls it down and places it on a stone slab. She looks at me. I look down at the ground. This is not what the chicken you eat for dinner is supposed to look like. Do I ever. Both our parents grew up in rural settings—our father on a farm in southern Oregon and our mother in small towns in northern New Mexico. The killing of animals for food was not unknown to us. We had heard tales of, for example, butchering chickens gone horribly wrong. Tripping over a shovel while trying to catch a chicken. Heads not properly cut off. Blood spurting from a vein. The slimy feel of pulling out the innards. “O.K,” I sigh and turn back to the task at hand — the chicken lying on the slab in front of me. I step closer to the meat counter. The woman smiles at me. She wants to help, but she can’t figure out what I want. I realize that I need to say something, but I don’t want to. 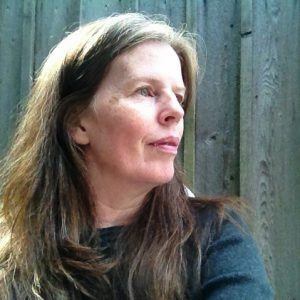 As an adult, when I tell people, I was incredibly shy as a child, they often don’t believe me. But, I was. While I liked to be around people, I didn’t like to talk to them. I preferred to stay in the corner, out of sight. Whenever I paid for something in a store, I rarely looked at the cashier. If I had to ask someone a question, I would always stand quietly until I was noticed. None of these approaches would work in this Viennese grocery store. My sister didn’t know what to do, either. I was the oldest. I would have to come up with something. As I would discover, opening one’s mouth doesn’t always guarantee complete success, but it gets you farther than saying nothing. 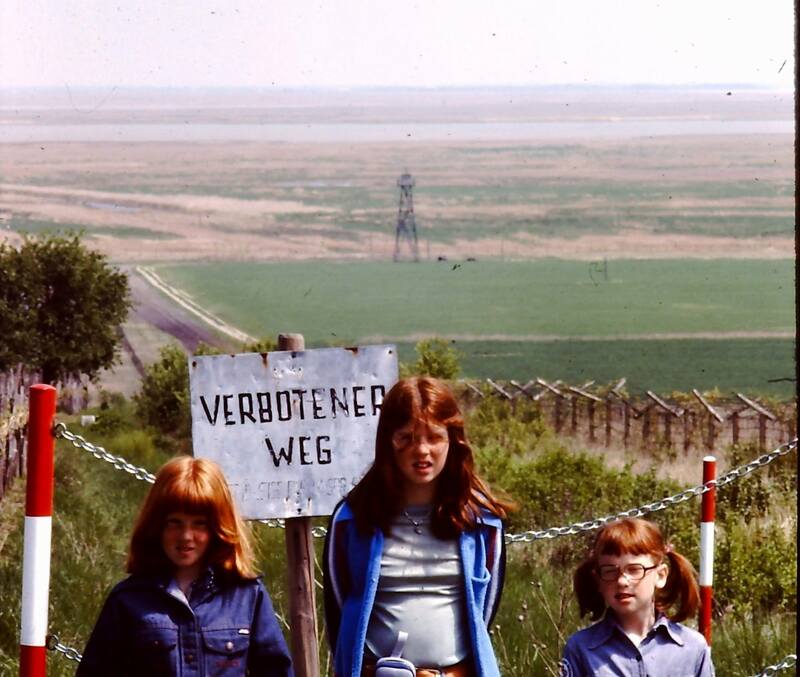 Standing in front of the border between Austria and Hungary when it was part of the Iron Curtain. Image: John Foley (Margaret in middle). I would have to come up with something. Panicked by the chicken’s appearance, I rack my brains for a few words of German. I only know a few phrases. I momentarily wish we were in Spain. I know quite a few Spanish words. All the streets in my neighborhood in Los Alamos have Spanish names, as do many towns in New Mexico. I actually know the Spanish word for chicken. It’s gallina. It’s the name of a town near where my grandmother lives. I don’t know if I would make sense in Spanish, but I know that I could say a word or two that would contain the word chicken. Suddenly, I am inspired. I move even closer to the counter. Bright-eyed, I look at the woman. She smiles at me encouragingly. “Bitte?” I ask, and then, as I draw my index finger across my neck, I make a cutting, slicing sound. “Ja,” the woman bursts out laughing. I grin, relieved. She understands what I want. She picks up a meat cleaver and chops off the chicken’s legs and head, wraps it in paper, and hands it to me. Mission accomplished. After we pay, my sister and I sister walk home, making a brief stop at a konditorei to buy five Linzer cookies. What we don’t realize until we get home and proudly show our mother our purchases is that the juice is really apple vinegar and that the chicken’s insides are still intact. But, it doesn’t matter. Vinegar always comes in handy, and after all, a partially prepared chicken in the pot is certainly worth two on a meat hook.